Research commissioned by the Haren Botanic Gardens and TAAK, with financial support from the Mondriaan Fund. HAREN – Since the Hortus Botnicus no longer has its scientific function, these botanic gardens are seeking a new raison d'etre. Under the auspices of the art project 'Lost and Re-found', the Hortus Botanicus invited Sjaak Langenberg & Rosé de Beer to investigate whether the hidden and partially forgotten qualities of the botanic gardens could be made visible again. A large group of volunteers cares for the gardens – what does this caring do for them? 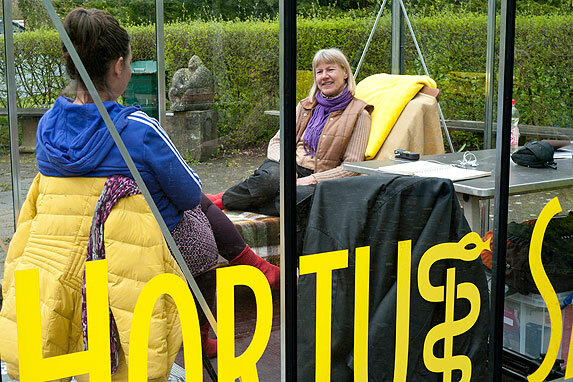 The Hortus Botanicus in Haren not only offers a safe haven for the plants, but also to the people who work there – that's what Langenberg & De Beer discovered when they camped in the Botanic Gardens as artists in residence. A greenhouse with the inscription Hortus Sanare – sanare is Latin for healing – was the setting for their interview and presentation. The greenhouse served as a temporary 'sanatorium' and was slowly filled with striking statements from volunteers about the work in the gardens and the differences between the world of the garden and the world beyond. The research eventually culminated in the design of the Hortus Hermitage.